I recently started playing around with Ruby and Rails. I haven’t done much with it yet short of these CodeSchool courses, but it seems really powerful. I did run into a bit of a hiccup when installing it, though, so I thought I’d write a quick post on how to get it installed in windows. Ok, the first thing you need to do is get the files you’re going to install. A quick search for “Ruby on Rails download” will lead you to this page: http://rubyonrails.org/download. The page tells you to download Ruby and RubyGems, but you’ll also need one more file. 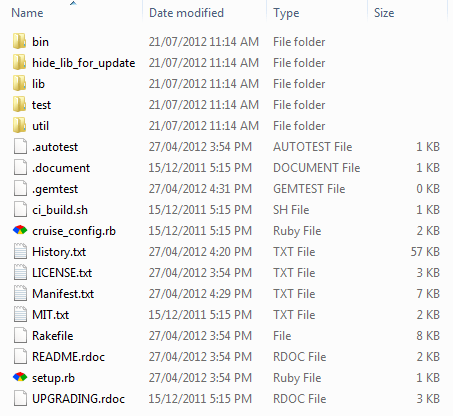 Note these files are the latest versions as of this writing. You may see newer ones if they have been updated. OK, so you have the three installer files now, so let’s get started. Then click “Next >” and you’ll be given a choice on where to install it to. I don’t like to clutter up my C: drive, so I installed it to C:\langs\Ruby193. You can keep it as the default or put it wherever you want. You’ll probably want to check the three tick boxes as well. Add Ruby executables to your PATH – This will allow you to run “ruby” and other ruby exes from any directory in the command prompt. Associate .rb and .rbw files with this ruby installation – The only reason you may not want this is if the files are already associated with something else. Click “Finish” and you’re done installing Ruby! 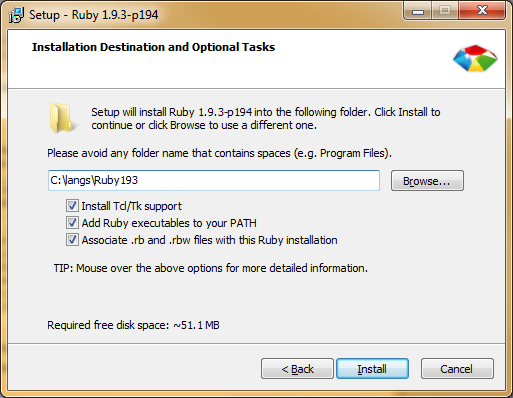 Note: if you didn’t add Ruby executables to your PATH, you’ll have to provide the full path to Ruby. Also, If you did Associate .rb and .rbw files with the ruby install, you can just run “setup.rb”. OK! 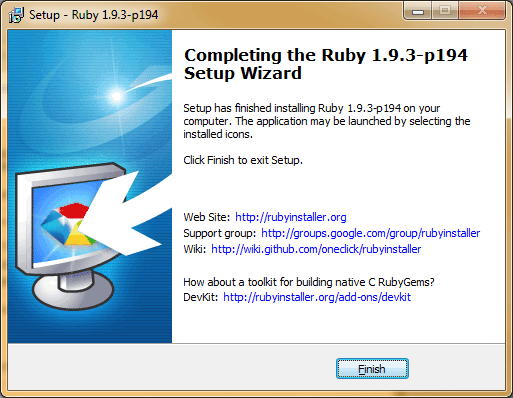 So, Ruby and RubyGems are installed. Woohoo! Almost there. Installing json (1.7.3) Gem::InstallError: The 'json' native gem requires installed build tools. Please update your PATH to include build tools or download the DevKit from 'http://rubyinstaller.org/downloads' and follow the instructions at 'http://github.com/oneclick/rubyinstaller/wiki/Development-Kit' An error occured while installing json (1.7.3), and Bundler cannot continue. Make sure that `gem install json -v '1.7.3'` succeeds before bundling. An error occured while installing json (1.7.3), and Bundler cannot continue. Make sure that `gem install json -v '1.7.3'` succeeds before bundling. The 'json' native gem requires installed build tools. [INFO] found RubyInstaller v1.9.3 at C:/langs/Ruby193 Initialization complete! Please review and modify the auto-generated 'config.yml' file to ensure it contains the root directories to all of the installed Rubies you want enhanced by the DevKit. Initialization complete! Please review and modify the auto-generated 'config.yml' file to ensure it contains the root directories to all of the installed Rubies you want enhanced by the DevKit. The first line, beginning with [INFO] should show the path you installed Ruby to in Step 2. Don’t worry about looking at the config.yml file unless you know you have other Ruby installs you want (or don’t want) to link it to. Based upon the settings in the 'config.yml' file generated from running 'ruby dk.rb init' and any of your customizations, DevKit functionality will be injected into the following Rubies when you run 'ruby dk.rb install'. This should match the path to whatever was detected when you ran ruby dk.rb init (which should be your Ruby install directory from Step 2). And your done! DevKit is installed! You’ll see it create a bunch of files and run a bunch of fun stuff. It will also install a few gems and eventually it should complete with no errors. Step 7 – Test It! That’s it! You’re done. I hope this post has helped someone out who was having the same issues as me. If you have any questions or comments drop them in the form below. 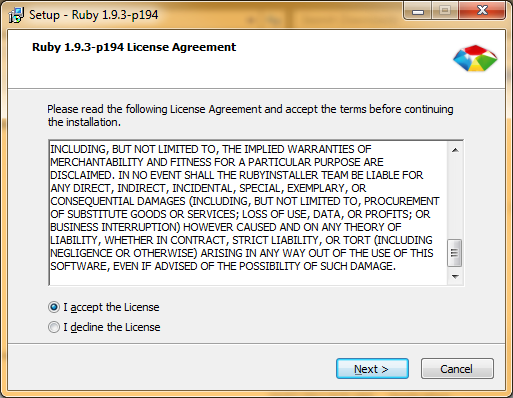 Trying to install ruby and ror on windows had been a nightmare. Fortunately I stumbled upon this helpful tutorial. After hours of fumbling around, I’ve finally have ruby/ror up and running in less than half an hour thanks to your help. Very straightforward and helpful. Many thanks. Richard, thank you very very much for this excellent step-by-step tutorial. My rails is working now. Glad I could help! Were you using the latest version or the version I noted here? I should probably update this for the newest releases. Good luck with your biz adventure of working for youself. Thank you for your guide. It was invaluable. I seem to have one problem. When I attempt to follow Step 6 it doesn’t recognize the command (‘rails’ is not recognized as an internal or external command etc…). I’m fairly certain I followed all your steps correctly. Should I uninstall and start from Step 1 again? It sounds like either rails didn’t install correctly or the path to rails isn’t in your system’s PATH variable. Did you get any error messages when you installed rails in step 4? Do you see anything when you run ruby -v? Try restarting the computer and running it again. Thank you for your help Richard. I got no error messages from Step 4. The error I did receive was the expected one from Step 5 from not having the DevKit installed yet. I’ve restarted my machine and attempted to re-run the “rails new .” but still receive the same command not recognized error. Can you try running gem install rails again? 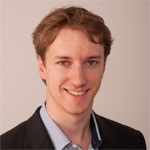 Makefile:165: *** target pattern contains no %'. Stop. Makefile:165: *** target pattern contains no %’. Stop. 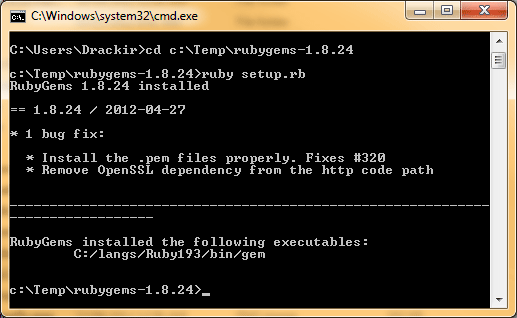 Gem files will remain installed in C:/Ruby193/lib/ruby/gems/1.9.1/gems/json-1.8. That worked! I’ve created the test web site and successfully navigated to it on my browser. Thanks again for all your help Richard. It’s much appreciated! Got this post after 2 days of trails. What could be the problem? This post is the closet one I could get so far and really hope can make it work. It sounds like the same issue. My problem was with the devkit. Your tutorial really helped. Thanks. Mr Richard, thank you very much for this excellent step-by-step tutorial. My problem was with the devkit . My rails is working now.